“Wake Up” feels different than your average episode of Supergirl. There’s very little in the way of action and there isn’t a traditional villain for Kara to fight. It’s pretty much just a straight sci-fi character drama with a Twilight Zone-esque twist at the end. It’s an outing that easily could’ve felt like filler, like last week’s Midvale flashback. But a strong script by Gabriel Llanas and Anna Musky-Goldwyn as well as some cinematic direction from Chad Lowe elevate the quieter, character-centric material. “Wake Up” isn’t a perfect episode. A lot of its mysteries are needlessly stretched out and I imagine many viewers were well ahead of the show in terms of where Mon-El and Sam’s storylines were headed. But it’s not just about the destination, it’s also about the journey. And “Wake Up” utilizes a darker, more dramatic tone to make that journey an intriguing one to watch. After a bit of charming banter between J’onn, Winn, and Kara to remind us we’re still watching an optimistic superhero series, the episode splits its time between three more somber storylines: J’onn reconnecting with his dad, Sam reenacting the pilot of Smallville, and Kara dealing with the unexpected return of Mon-El. Both J’onn and Kara’s storylines center on the idea of time. How do you reconnect with someone you love after spending so much time apart from them? In J’onn’s case, that distance is obvious. He’s been separated from his father for over 300 years and he’s struggling to figure out how to reestablish a relationship with a man he long ago assumed was dead. I think the episode is a little harsh when it comes to critiquing J’onn for not having a life outside of work (Kara and Alex are basically his daughters and he dated M’gann for a while), but overall the J’onn storyline is a sweet runner about two men learning to open up to one another despite the distance that’s been built between them. Though J’onn’s storyline is about two shapeshifting Martians who live for hundreds of years and only have to go to the bathroom every few weeks, it’s downright pedestrian compared to the bonkers sci-fi premise at the heart of Kara’s story. From her point of view, it’s only been seven months since she sent Mon-El off in his escape pod. From his point of view, however, it’s been seven years—seven years he spent on Earth in the 31st century. Given my mixed reaction to the character last season, I was a little nervous about how the Supergirl writers would weave Mon-El back into the show. 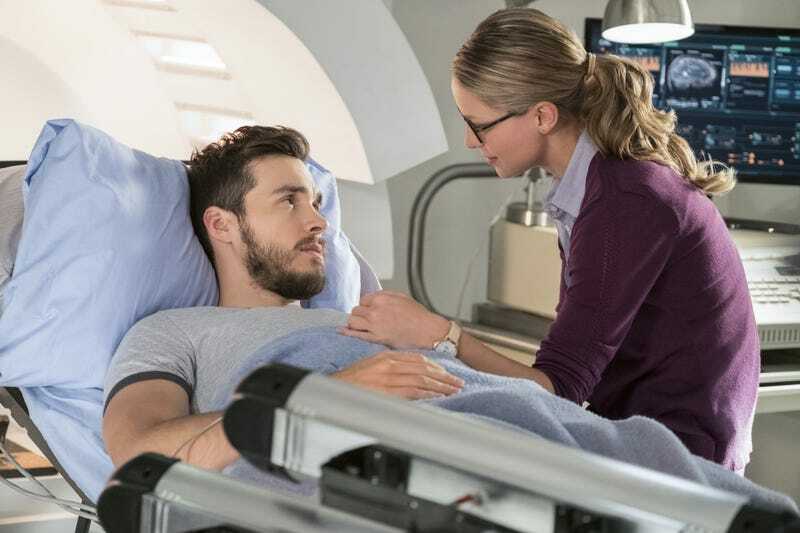 If he were to just return to National City magically cured, it would negate all the emotional storytelling Supergirl has done around Kara’s heartbreak. But, to their credit, the writers find a clever way to bring Mon-El back into the fold without undoing their previous storytelling choices. Not only has Mon-El been away for seven years, he’s now married to a 31st-century Saturian woman named Imra. I have no idea where Mon-El’s story goes from here and it’s possible Supergirl is heading right back into well-trod love triangle territory, which would be a disappointment. But the fact that Imra is Mon-El’s wife rather than just his girlfriend makes me think the show might have something more complex up its sleeve. And if the other three people in the pods on Mon-El’s ship turn out to be his kids, I’ll really give the writers credit for committing to this premise. As I said before, the fact that Mon-El refuses to just explain what’s going on is a weak way to stretch out this episode’s central mystery. But on the other hand, I kind of buy the idea that his joy and confusion over seeing Kara again mixed with his guilt over having to break her heart would make him clam up. And more so than anything, the concept of Mon-El starting a new life in the 31st century before being brought back to his old one is so great that I’m willing to cut the episode some slack for its wobbles in introducing it. Supergirl has created some really effective storytelling around the time and space jump baked into Kara’s origin story, and I’m hoping the show will be able to do the same with Mon-El. The benefit of a slower, character-driven episode like this one is that it really gives the show’s cast a chance to shine. And as ever, Melissa Benoist elevates the entire episode with her empathetic, emotionally vulnerable performance. Her speech outside Mon-El’s prison cell about the nightmares she’s experienced since he left is a particular standout (few actors do crying scenes as well as Melissa Benoist), as is the heartbreaking moment Kara plasters on a smile while being introduced to Imra. In addition to Benoist, the slower pace also allows the show to utilize the supporting cast members it hasn’t checked in on a while. It’s nice to see Supergirl remember the Winn/Mon-El friendship, and Jeremy Jordan does some nice work in his own confrontation with Mon-El. There’s even a sweet and unexpected conversation between James and Kara, which fueled my hope that this show will one day figure out how to actually use Mehcad Brooks. And while Chris Wood is mostly just asked to brood, he does eventually get to bring some charming lightness to his conversation about Kara’s love for all-you-can-eat ribs. It turns out Ruby is another key figure who separates Sam’s story from Clark’s. Getting pregnant delayed the appearance of Sam’s abilities, which were supposed to manifest around her adolescence. And Ruby has also given Sam a human attachment her Kryptonian creators didn’t plan for, which I’m sure will become relevant later in the season. But for now, however, Reign’s finally ready to do what she was designed to do: kill worlds and deliver punitive justice. In a disappointing end to the atmospheric short story that came before it, the Fortress’ hologram “transforms” Sam into Reign. Rather than explore Sam’s emotional reality at being told she was born to be a weapon, the show just wipes the slate clean and turns her into a full-on villain. 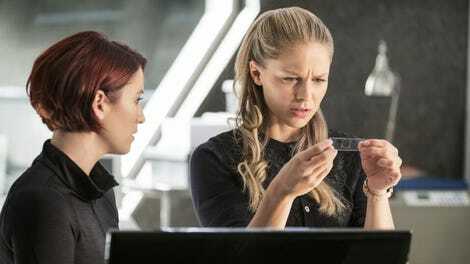 I’m sure we’ll eventually see Sam Arias struggle to reassert herself over Reign, but it’s frustrating to watch Supergirl create a really fascinating scenario and then wipe it all away. Hopefully the show won’t do the same with the new Mon-El status quo. I agree with Kara, Mon-El looks good with a beard. Carl Lumbly is really funny as he plays up M’yrnn’s upbeat awkwardness. I enjoyed Kara winding up to drill a hole into the ground, a trick she says she’s seen Clark do before, which is a reference to Christopher Reeve’s Superman. Odette Annable did great work with her monologue about getting hit with a bullet and not even feeling it. Okay, it is a little weird that J’onn was apparently living at the DEO.